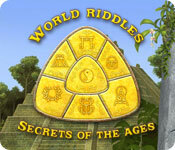 World Riddles: Secrets of the Ages is rated 3.8 out of 5 by 30. Rated 5 out of 5 by sparkynugget84 from Playing through a 3rd time! I love this game! I've played it through twice, and I can't get enough. I love the challenge. There are achievements to earn and restore points let you learn a little bit about the history of the civilizations you are playing. The only problem I can think of is that I'm no good at it until after my first cup of coffee soaks in. I prefer this to the other games in the series, only because the tiles are better. Rated 5 out of 5 by MEnr56 from EARN MONIES WITHOUT RESTARTING THE WHOLE GAME A gamer does NOT have to replay the entire game under a new profile and NOT finish the entire game 20 levels BEFORE restoring the entire collection of artifacts. I had completed all 20 levels of a certain location WITHOUT restoring the entire collection of artifacts and ascertained that despite the lack of display of increased monies when replaying silver levels within those 20 levels -- your money is SLOWLY increasing to allow you to restore whatever number of artifacts is left. The score DID show me that I completed one of the REPLAYED levels with NO HINTS having been used and UNDER the expert's time (though it did claim that I also had 1 error which I was surprised at as I thought that I'd also completed the level with NO errors) so I am NOT sure if having accomplished 2 of the 3 goals is important or not. 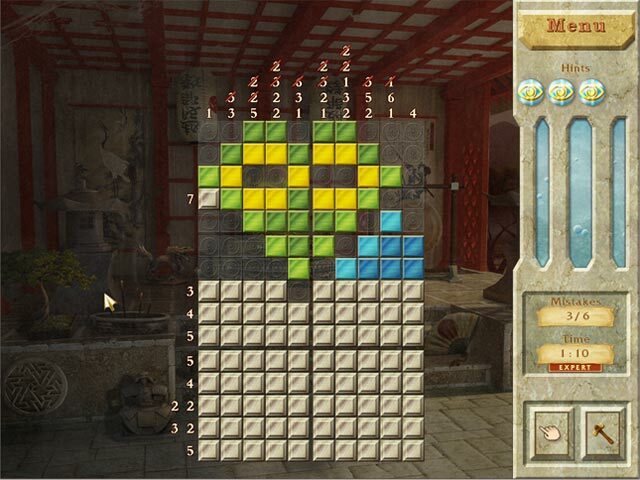 I found this particular game MORE challenging that the other World RIddles and World Mosaics games (or maybe my memory is just short-term...hmmm) from the onset but very entertaining and fun and educational. Rated 5 out of 5 by gamer6974 from Love it! I was instantly absorbed into this game! Rated 5 out of 5 by phiragirl from addicting I usually play hog/adventure games but i was hooked by this game from the moment I got to play the Beta test version. I hope they release a ''sequel'' soon! Rated 5 out of 5 by cadgirl23 from addicting i can't stop playing this game. Rated 5 out of 5 by Kainata55 from Excellent logic puzzle I love this game. 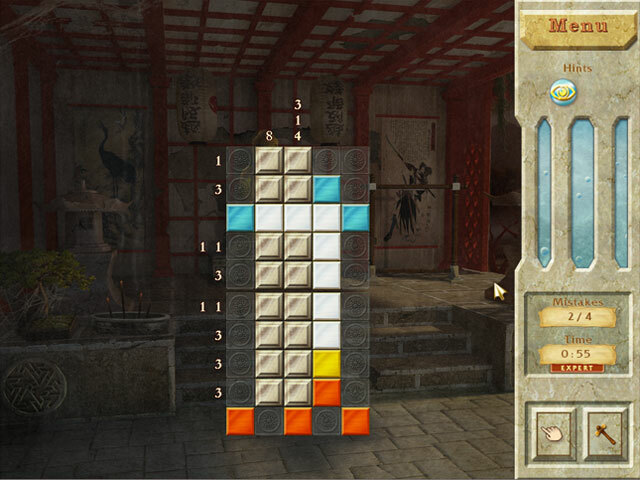 Lots of puzzles, 140 different mozaics in seven levels of increasing difficulty, plus the bonus play. Some of the 25x25 matrices are really hard! The mechanics work very well on my Mac and are improved over the first entry in this series. 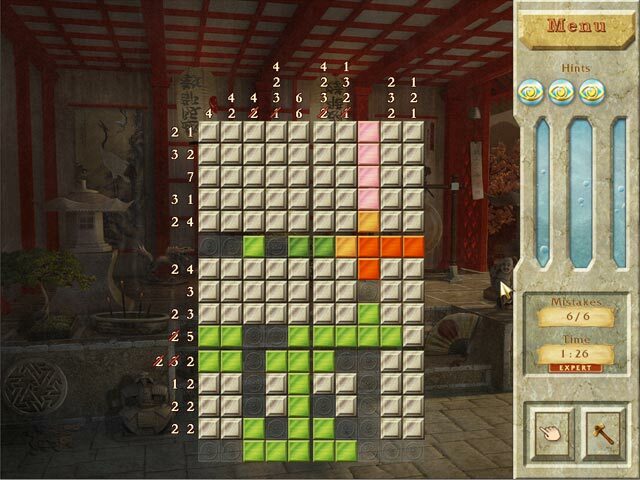 If you like logic puzzles that involve numbers (like Sudoku) this game is for you. Rated 5 out of 5 by royallyconfused from Good Logic Puzzles I love Big Fish Games, but they sure seem to be lacking in the logic puzzle category. I'll probably end up buying all of sister games to this one. This game has a lot of levels so I'm pleased with its value.